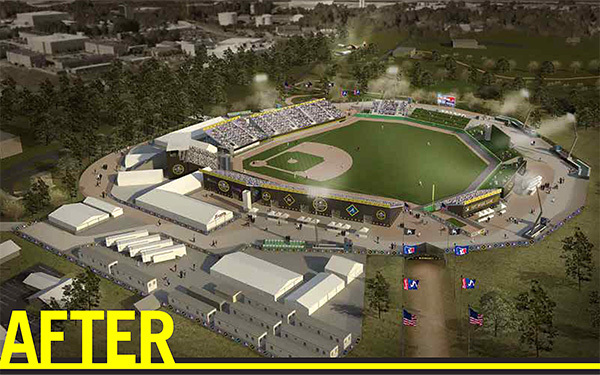 MLB will build a ballpark at Fort Bragg. The Atlanta Braves and Florida Marlins will play a regular-season game in celebration of US servicemen and servicewomen at Fort Bragg on July 3. The first-of-its-kind regular season game will be played at a new 12,500-capacity ballpark constructed by Major League Baseball and the Major League Baseball Players Association. The game will be part of Fort Bragg's annual Fourth of July festivities. "Major League Baseball's boundless gratitude to our military has led us to a unique event that will benefit the men and women of Fort Bragg and their families for many years," said Baseball Commissioner Rob D. Manfred, Jr. "I thank the Braves and the Marlins for their participation and all of our Clubs and Players for contributing to this gesture, which will stand as a fitting new chapter in the National Pastime's proud and distinguished military history." 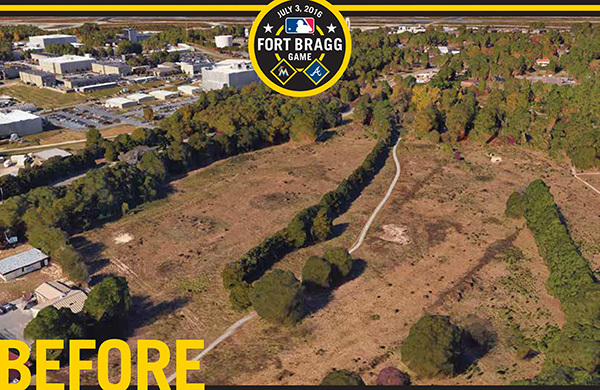 After this game, the ballpark will be converted into a permanent softball field and multi-use facility for those serving at Fort Bragg, a gift from MLB. "We're extremely grateful to Major League Baseball and the MLB Players Association for their support to our Service members and families," said Col. Brett Funck, Fort Bragg Garrison Commander. "This historic event and the converted multi-purpose facility will have enduring benefits for our entire Fort Bragg community for years to come." The event will be the first time a regular-season game of a professional U.S. sport has ever been played on an active military base. The game was originally scheduled to be played at Atlanta's Turner Field, and the Braves will remain the home team. The game will air nationally on ESPN's "Sunday Night Baseball" and on ESPN Radio at 8 p.m.
"The Atlanta Braves organization is extremely honored to be chosen to play in the Fort Bragg Game and to entertain some of our nation's patriot men and women," said Braves President John Schuerholz. "It is special for our fans and our entire organization that we are playing this game in Braves Country - Fort Bragg, North Carolina." Marlins manager Don Mattingly is looking forward to the game. "It is a privilege for the entire Marlins organization to bring our team to Fort Bragg in a show of gratitude for our servicemen and women and their families," said Marlins manager Don Mattingly. "The opportunity to participate in this game is truly humbling."